agileBase has a number of workflow features built in that get a lot of use. they work with any app you build using the platform and cover things like auto-setting field values on creation, sending notifications, moving data between views etc. We’re now adding a new workflow engine that can automate many more tasks. 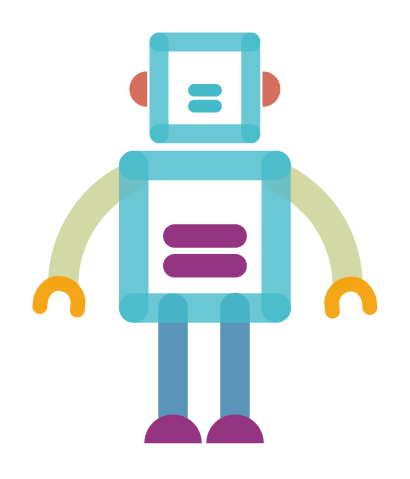 Meet agileBot! It can automatically edit records and create new records, saving a lot of manual typing. 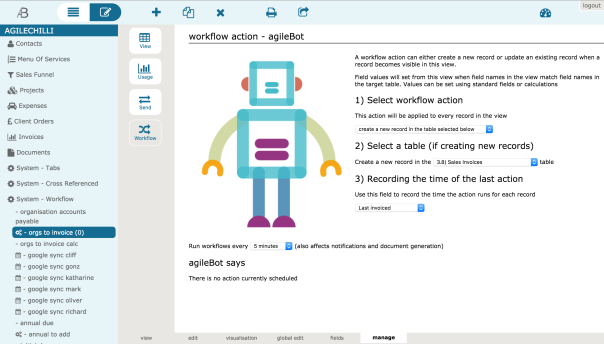 agileBot can be set up to follow rules for creating new records, editing values in existing records or taking other actions. The rules can be simple or complex, in fact anything that can be represented by a standard view, which makes it really powerful. This can be used in conjunction with other workflow features such as the ability to send email notifications or generate documents, and many steps can be chained together. Many business processes can therefore be fully automated. 2) Any records which become visible in your rule view will trigger the action selected. So add filters (on a calculation if necessary) to select only the records you wish to trigger the action. 3) If creating or editing a record, the fields in the view will populate the new or existing record. Any fields in the view with the same name as a field in the table will populate that field with it’s data. The view field can be a calculation as well as a standard field. Fill in the options. For ‘Recording the time of the last action’, select a date field in the table the view’s based on. This date will be updated every time the workflow runs. If there’s no relevant date field existing, add one to the table. You may know of workflows, or automations in agileBase. These are automatic tasks that run in the background, to do things like send emails from the system, generate PDF documents or create/update records. Due for release tomorrow is a new feature that leverages the workflow engine to massively increase the power of the user interface. In short, you can now create workflow actions that can be run ‘manually’, from buttons in the user interface, rather than automatically in the background. Furthermore, you can chain actions together, to make multi-step workflows that run at the click of a button. An example is the ‘print labels’ button here. So for example, if your system receives customer orders that need to be produced on the factory floor, you can create an automation that takes a snapshot of all the orders so far and generates production sheets for the quantities required. It can then be run multiple times a day on demand to pick up new orders. Developers commonly wish to have ways of manually interacting with third party applications, e.g. to send data to a custom app for processing, this should be very useful for them too. To set up a button, first create a workflow as normal, using the ‘workflow’ button in a view’s ‘manage’ tab. For the frequency, rather than say ‘run workflows every 10 minutes’, select ‘manually’. Note: to chain workflows together, select a workflow name under ‘chain workflow’. That workflow will run as soon as the first completes. You can chain as many as you like together. Remember to set frequency to ‘manual’ for all of them. Finally, create a button. This is simply a matter of selecting a view where you want the button to appear. When the user clicks that view in a tile, the button will appear above. In the manage tab for that view, under ‘chain workflow’, choose the workflow view that should be run (the start of the chain if there’s more than one in the chain). If you want your workflow to set the value of a relation find, i.e. link to a particular record, there’s no need to create a calculation for it, just include the ID field for the record you want to link to in the view. If creating a calculation is easier, you can still do that. Either create a numeric calculation which outputs the internal row ID of the record to link to, or the text of the primary value for the relation. If the latter case, the field for the primary value in the related table should be unique and marked as such in the field options. To set a relation field to blank, add a numeric calculation with the name of the field as normal, but set it to output the value -1.